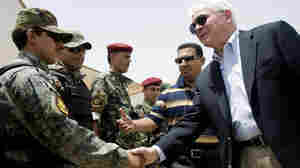 July 28, 2009  Robert Gates traveled Tuesday to southern Iraq to get a firsthand look at the U.S. military mission there. He is expected to meet with Iraqi political leaders, including Prime Minister Nouri al-Maliki. 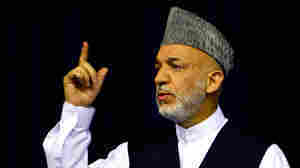 July 26, 2009  Afghan President Hamid Karzai could face serious competition in his bid for re-election. A surge in support for his rivals means the U.S. could be dealing with new leadership as it builds up American forces in Afghanistan to counter the Taliban. July 22, 2009  Secretary of State Hillary Clinton warned Iran that if it keeps pursuing nuclear weapons, the U.S. could respond by boosting the defenses of its allies in the Persian Gulf. Israel was not impressed by the warning and suggested it was a sign of U.S. wavering on Iran. July 22, 2009  Secretary of State Hillary Clinton is meeting in Thailand with foreign ministers from the ASEAN alliance. The 10-nation group includes longtime friends, former enemies and some very complex relationships. Is Clinton's India Visit Paying Off For The U.S.? July 20, 2009  Secretary of State Hillary Clinton signed several important agreements with India on nuclear development and weapons sales, but didn't make much progress on climate change. Could she have done more? July 18, 2009  North Korea's recent belligerence — its nuclear and missile tests — may be part of a secretive internal power struggle, analysts say. But it's difficult to get information on who might be in line to succeed ailing dictator Kim Jong Il. Will it be his youngest son, with Kim's brother-in-law in the shadows? Who's Behind The Jakarta Bombings? July 17, 2009  Analysts say an aggressive counter-terrorism effort by the Indonesian government has crippled the Islamist militant group Jemaah Islamiyah. Could the latest attacks be an effort by the group to show strength and re-establish ties to al-Qaida? July 15, 2009  Much of Haiti is an environmental disaster area, its mountains stripped of trees, its soil easily eroded by heavy rains that produce deadly floods and mudslides. Activists and entrepreneurs are coming up with ideas to reverse that damage. How Far Did CIA Assassination Plans Go? July 14, 2009  CIA Director Leon Panetta has quashed an agency program that considered forming assassination squads to kill al-Qaida leaders. Among the lingering questions: How far did those plans get, and should Congress have been advised? July 13, 2009  A wave of British casualties in Afghanistan has triggered angry questions from opposition leaders in parliament. They say the government has failed to provide vital equipment, leaving British forces vulnerable. It's not clear whether the losses have shaken public support for the war. July 10, 2009  President Obama has chosen one of Africa's most stable democracies for his first official visit to the continent. Africa watchers hope he'll outline his foreign policy for Africa in a speech to Ghana's Parliament. July 9, 2009  The world's leading industrialized nations met Thursday with fast-developing countries such as Brazil, India and China. The aim is to speed action on a world trade agreement that could prevent trade barriers from hampering the world economy. June 19, 2009  Analysts say Iran's Supreme Leader Ayatollah Ali Khamenei is seeking to weaken government opposition and defuse tensions, while also warning demonstrators to stop, or face the consequences. He also reached out to one of the opposition's behind-the-scenes leaders. June 17, 2009  Administration officials say Middle East expert Dennis Ross could move soon from the State Department to the White House. The move would signal that the administration is aiming for a more unified strategy on Iran and the entire Middle East. June 17, 2009  The tumult of Iran's presidential election is just the most visible part of a power struggle with deep roots in the country's theocratic government. Here's a look at the inner circles of Iranian political power.